If you live in a house or bungalow, you can normally make certain types of changes to your home without needing to apply for planning permission. This right is normally afforded under "Permitted Development Rights". However, these rights have limitations, and can vary depending on the location of your property and whether your home benefits from these rights in the first place. Please note: irrespective of whether planning permission is required, approval under Building Regulations may be required, as they are two separate matters. From 15th April 2015 new Permitted Development Rights came into force. 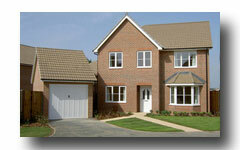 This made it easier to improve your house or bungalow by relaxing planning controls on smaller extensions. It also introduced new controls over hard surfaces such as driveways, aimed at reducing water run-off which contributes to flooding. 2016 - as set out in the Town and Country Planning (General Permitted Development) (England) (amendment) Order 2016. 2016 - as set out in the Town and Country Planning (General Permitted Development) (England) (amendment) (No.2) Order 2016. 2017 - as set out in the Town and Country Planning (General Permitted Development) (England) (amendment) Order 2017. 2017 - as set out in the Town and Country Planning (General Permitted Development) (England) (amendment) (No.2) Order 2017. For a time limited period, until 30 May 2019, Class A makes provision for the erection of larger single storey extensions to the original rear elevation of a house - 8 metres for detached houses and 6 metres for all other houses. Before work can take place the applicant must submit a Notification of a Proposed Larger Home Extension application form here and guidance notes to assist can be viewed here. The proposal works involve a flat/maisonette. The works to be carried out are not within the lawful residential curtilage, usually the garden area of the property. Any land which has been 'added' to your curtilage will normally have Permitted Development Rights withdrawn. If your home is a Listed Building or contains Listed structures within its curtilage, then Listed Building Consent may also be required. The Development Control service has a free Pre-Application Enquiry Service if you are still unsure as to whether to you require a planning application, and in these circumstances, we advise you to complete the Council's Householder Enquiry form. If a planning application is required, you can make your application online. Further advice and guidance is available via the following pages, listed below. This looks at permitted development rights in relation to driveways, micro-renewables and satellite dishes in more detail. It also offers advice on dropped kerbs, drainage and flooding, the Party Wall Act, works to trees and hedgerows, and many other relevant matters to this level of planning. If you cannot find the information you are looking for, or wish to clarify detail, please contact the Development Control Team by email or by calling 01827 715341.